This is the third and last installment of my series on Destinations. Week one included places to visit in Texas. Week two was all about places I have been outside of Texas. Today, I'll focus on places I have never been to that I would like to visit someday. I wonder how many, if any at all, I will ever get to visit. It's just a wish list, though. 1. New York, NY - Statue of Liberty, shows, lights, Central Park, Ground Zero, and other points of interest. I hope I get to visit someday. 2. Charleston, SC - History and beaches! 3. Memphis, TN - Graceland, museums, and scenery. 4. Ontario, Canada - I'd like to go to Niagara Falls. 5. London, England - Big Ben, Buckingham Palace, museums, and castles! 6. Rome, Italy - The Ancient Colosseum, The Pantheon, Vatican City, The Sistine Chapel, oh, and the food! Italy! It's gotta be the best food in the world! 7. Hawaii (any island!) 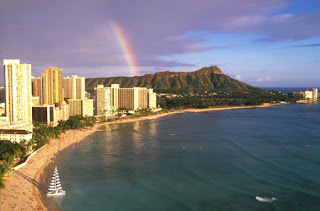 - Beaches, museums, volcanoes, and beautiful scenery. 8. Paris, France - The Louvre, the Eiffel Tower, and the food! 9. Amsterdam, Holland - I would love to visit Anne Frank's Secret Annexe. 10. Cabo San Lucas, Mexico - Swimming, snorkeling, and scenery. 11. Ocho Rios, Jamaica - or maybe Montego Bay. What else except beaches? 12. Anchorage, Alaska - Mt. McKinley, whale watching, and air taxis to watch grizzly bears. 13. Sydney, Australia - Sydney Harbour, Bondi Beach, Taronga Zoo, and much more. Visit more Thursday 13 here! I was thinking about you!!!!! I need to do some research about your area. You've given me an idea for a 4th destinations post - to visit bloggers I would like to meet. Thanks for the idea.